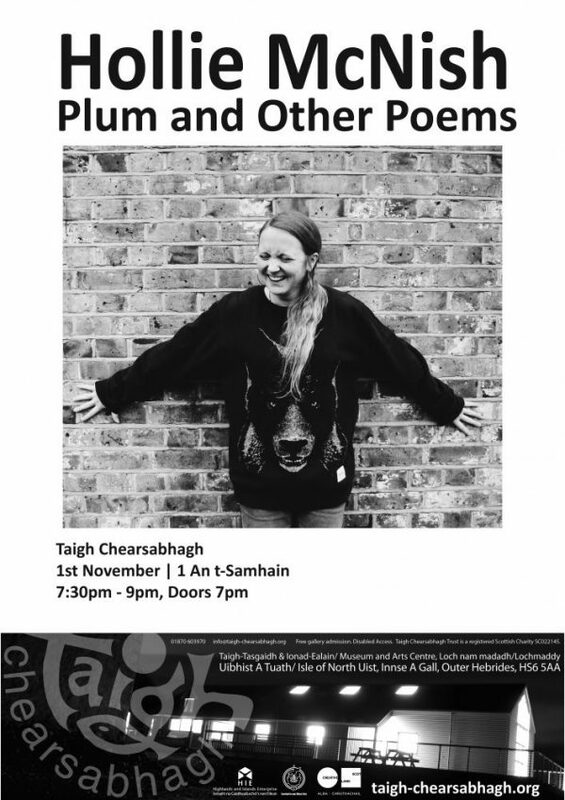 We are delighted to be hosting poet Hollie McNish for her performance of Plum and Other Poems at 7:30pm on the 1st of November at Taigh Chearsabhagh. Tickets are £6 and £5 for concessions. Benjamin Zephaniah stating ‘I can’t take my ears off her’, Kate Tempest describing her poetry as ‘welcoming, galvanising and beautiful’ and fans ranging from Robin Ince, Pink and Tim Minchen, Ted Hughes Award winner Hollie McNish is a poet whose readings are not to be missed. She is an Arts Foundation Fellow in Spoken Word, has garnered over ten million YouTube views for her online poetry performances and was the first poet to record at London’s famed Abbey Road Studios. In 2018 she won the Ted Hughes Award for her collection Nobody Told Me, about which the Scotsman said: The world needs this book. In February 2016, Blackfriars published her memoir of poetry and parenthood, Nobody Told Me, with which she won the Ted Hughes award. Her latest poetry collection, Plum, is published by Picador.